Grigory Chukhray‘s movie Ballad of a Soldier aka Ballada o Soldate is an iconic Russian war movie, which is often mentioned together with another famous Russian movie of the same time, The Cranes are Flying aka Letyat zhuravli. Both films are excellent and combine heartfelt stories with luminous black and white cinematography. 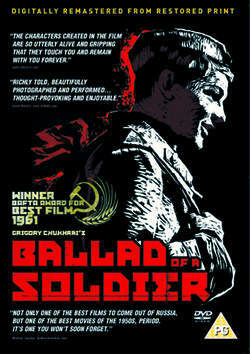 Ballad of a Soldier begins with a scene showing a woman looking into the distance. The road we see is the only one leading to and from the village in which the woman lives. She doesn’t expect anyone to come. Her son has died during the war and nobody will ever know what would have become of him. The movie then rewinds to a famous scene on the Russian frontline and we see her son, nineteen year-old Alyosha, a young signalman, blowing up two German tanks on his own. This heroic act would bring him a medal but he’d rather be granted a leave to visit his widowed mother and fix her roof. The general in charge, one of a few kind officers, allows him to take a five-day leave. Russia is a huge country and travelling by train would always take a long time, but during a war it’s almost impossible. Alyosha’s trip quickly turns into an Odyssey. Because he’s kind and helpful, he misses his train more than once. At first he helps a soldier who has lost his leg, then he assists a young girl and the two young people fall in love. Later he helps people after the train is hit by a bomb. When he finally arrives at home, he has only time to hug his mother, exchange a few words and has to leave again immediately. Since we know that he will die during the war, this scene is all the more poignant. The movie shows how everyone is affected by war, even those who don’t fight. In focussing on someone as kind as Alyosha, someone who genuinely cares for other people the movie makes a powerful anti-war statement. Much more than his heroic act of the beginning, his humanity and kindness make us sad and we deplore that he will never return to his mother, nor get a chance to find the girl he fell in love with. Something that struck me was that all of the Russian officers, and most of the soldiers in this movie are depicted in a positive way. Like in The Cranes Are Flying, many shots focus on the faces of the actors who are very expressive. While the first film sticks more to the point of view of a woman, this is told mostly from the point of view of a young man, which makes them great companion pieces. The scenes between mother and son are short but still I’d say it’s one of the most touching portraits of a mother/son relationship. After all, it’s his love for his mother, that makes Alyosha persevere on his journey. I’d like to recommend this movie. It stands out and makes a powerful statement. Russia is another of those countries whose film production rarely disappoints. I haven’t seen all of the below mentioned movies yet but have read a lot about them and have seen parts of them. There are most certainly more but these seem to be the most important ones. They are quite different. 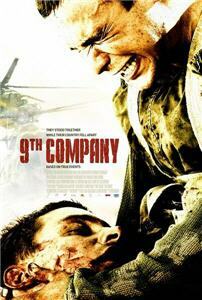 Some, like 9th Company, are pure, gritty infantry combat, others like Come and See are more experimental. Mongol and Admiral are quite beautiful. What they all have in common is a feel of authenticity, and a way of showing how atrocious war is that is very unique and emotional. If you haven’t seen any Russian war movies so far, I would suggest you change that as soon as possible. The Thief aka Vor (1997) Childhood drama that starts during WWII. Come and See aka Idi i Smotri (1985) A young boy gets caught up in the atrocities of WWII. The Dawns here are Quiet aka A zori zdes tikhie (1972) The story of a group of female soldiers during WWII. Ivan’s childhood aka Ivanovo detstvo (1962) A young boy works as a spy at the eastern front. Three Soviet officers try to take care of this boy-child. The Story of a Man aka Sudba cheloveka (1959) The story of a man whose life is destroyed by WWII. When his village is bombed his wife and children are killed. Battleship Potemkin aka Bronenosets Potyomkin (1925) A silent movie classic. One of the first war movies ever with a lot of famous scenes. Very expressive. It is also worth mentioning other movies by Sergei Bondarchuk like War and Peace or Waterloo. They are all excellent but mostly co-productions with international stars that’s why I didn’t include them but chose The Story of a Man instead. Do you have any favourite Russian war movies and/or recommendations? I’m amazed about the length of this list and even more so as I know exactly I have certainly forgotten quite a lot. It seems as if the combination of love and war was extremely well liked. Some of the movies I have included are somewhat more on the war side, like Enemy at the Gates, others are much more romantic. I was also surprised to see that I have seen a lot of them. And also liked quite a a few. Some of my favourites are Admiral, The Man Who Cried, Gloomy Sunday, King Arthur, Aimée and Jaguar and The Cranes are Flying. Others like House of Fools sound interesting but I haven’t seen them. What struck me was how often the main theme is about two men falling for the same woman. Amazing. As if war wasn’t complicated enough. A Farewell to Arms (US 1932) Gary Cooper and Helen Hayes. Affair between an English nurse and American soldier during World War I. Dark Journey(UK 1937) Conradt Veidt and Vivien Leigh. Spies of from opposing sides fall in love. Gone with the Wind (US 1939) US Civil War. Clark Gable and Vivien Leigh in the movie based on Margaret Mitchell’s novel. A Yank in the RAF (US 1941) Tyrone Power and Betty Grable. Americans serving in the British forces meet and rekindle an old flame. For Whom the Bell Tolls (US 1943) Gary Cooper and Ingrid Bergman in a movie based on Hemingway’s novel of the Spanish Civil War. Crash Dive (US 1943) Starring Tyrone Power, Anne Baxter and Dana Andrews. A submarine lieutenant and his commander fall in love with the same woman. The Life and Death of Colonel Blimp (UK 1943) Roger Livesey and Deborak Kerr. British soldier falls in love with various incarnations of the same woman. To Have and Have Not (US 1944) Lauren Bacall and Humphrey Bogart in a WWII drama about an American expat and a French resistance fighter. Set on Martinique. Piccadilly Incident (UK 1946) WWII. War separates husband and wife with tragic consequences. A Matter of Life and Death (UK 1946) David Niven and Kim Hunter. Pilot falls in love with radio operator. From Here to Eternity (US 1953) WWII, Pearl Harbor. Love and drama before the Japanese attack of Pearl Harbor. Great actors (Burt Lancaster, Montgomery Clift, Donna Reed, Deborah Kerr, Frank Sinatra), great story. Battle Cry (US 1955) Love and drama among a group of young Marines. The End of the Affair (UK 1955) Deborah Kerr, Van Johnson, John Mills in the movie based on Graham Greene’s novel about a novelist who falls in love with a married woman during WWII. There is a later version of the same movie, see below. A Town Like Alice (UK 1956) Peter Finch and Virginia McKenna starring in a WWII romance set in Asia. A British woman, POW of the Japanese, falls in love with an Australian soldier. D-Day, The Sixth of June (US 1956). On their way to the Normandy a US and a British officer remember their love for the same woman. A Farewell to Arms (US 1957) Rock Hudson and Jennifer Jones in a movie based on Hemingway’s novel. It tells the story of an affair between an English nurse an American soldier on the Italian front during World War I. South Pacific (US 1958) WWII, South Pacific. A young American nurse and a Frenchman who might be an agent fall in love. A Time to Love and a Time to Die (US 1958) WWII. Russian front. German soldier on leave falls in love. Doctor Zhivago (US/Italy 1965) Omar Sharif and Julie Christie starring in a war romance set during the Bolshevik Revolution. Based on the novel by Boris Pasternak. In Harm’s Way (US 1965) A classic John Wayne movie. WWII, Pacific. A naval officer falls in love with a nurse (Patricia Neal). A story of second chances. (Here is my review). Closely Watched Trains (Czechoslovakia 1966) WWII. Set in occupied Czechoslovakia. A young man working for the railway company falls in love for the first time. Based on Bohumil Hrabal’s novel. Landscape After Battle (Poland 1970) Poland after WWII and the liberation of the concentration camps. A young poet falls in love with a Jewish girl. Summmer of my German Soldier (US 1978, TV) WWII, US home front. An American girls falls in love with a German POW. Yanks (US 1979) WWII. British woman falls in love with an American soldier while her husband is at war. Richard Gere, Vanessa Redgrave and others. Hanover Street (UK 1979) Margaret is a nurse in England during WWII and married to a secret agent. Things get complicated when she falls for David, an American pilot. Starring Harrison Ford, Christopher Plummer and Lesley-Ann Down. We’ll Meet Again (UK 1982 TV mini-series) WWII, Britain. American bomber pilots in the UK. Winds of War (US 1983, TV mini-series) Robert Mitchum and Ali McGraw. WWII, America, until the attack of Pearl Harbor. A Year of the Quiet Sun (Poland/Germany/US 1984) A US soldier in Europe falls in love with a Polish refugee after the war. An Indecent Obsession (Australia 1985) Nurse falls in love with psychiatric patient. Top Gun (US 1986) Not set during a real war. Tom Cruise and Kelly McGillis star in this movie about a young fighter pilot who falls in love with a female instructor. Macho bravado and romance. The Last of the Mohicans (US 1992) Daniel Day-Lewis and Madeleine Stowe in an epic of the war between British and French colonialists and Indians. 1942: A Love Story (India 1993) Bollywood drama starring Anil Kapoor. A young Indian couple, both from wealthy backgrounds, find themselves caught up in the 1940’s Indian revolutionary movement against their families who are under the thumb of a sadistic British general. Braveheart (US 1995) 13th Century Scotland. The fight against the British rule. Some love this epic, some hate it, still it’s impressive for many reasons. Starring Mel Gibson and Sophie Marceau. In Love and War (US 1996) WWI, Italy. the story of the love between Ernest Hemingway and the nurse Agnes von Kurowsky starring Chris O’Donnell and Sandra Bullock. Aimée and Jaguar (Germany 1999) WWII, Germany. Holocaust. Two women fall in love in Berlin during the war. One of them is Jewish and in the Resistance. The End of the Affair (UK/US 1999) Julianne Moore and Ralph Fiennes in the movie based on Graham Greene’s novel. A novelist falls in love with a married woman during WWII in London. She leaves him without an explanation. Two years later he has her followed to try to find out why she left him. Gloomy Sunday (Germany/Hungary 1999) Set in WWII Budapest. Starring Joachim Król and Ben Becker. This is such a beautiful movie. Another love triangle. A young woman loves a Jewish restaurant owner. One day he hires a young pianist. She falls in love with the young man but still loves the older one. They save the life of a German man who also falls in love with the woman. When WWII breaks out the German comes back. He has turned into a Nazi officer who loves to abuse his power. Gloomy Sunday tells also the story of the famous Hungarian song Gloomy Sunday that is said to have caused more suicides than any other song ever. The Man Who Cried (UK/France 2000) Starring Johnny Depp, Cate Blanchett, John Turturro, Christina Ricci. A Russian Jew falls in love with a gypsy during WWII in Paris. She befriends another Russian who helps her find work in a theater. For lovers of sumptuous movies and opera. Dark Blue World (Czech Republic/UK/Germany/Denmark/Italy 2001) Czeck fighter pilots in England in WWII. Two pilots, a very young one and an older one fall in love with the same woman. Captain Corelli’s Mandolin ( UK/US/France 2001) WWII, Italian troops in occupied Greece. Based on Luis de Bernières eponymous novel, starring Penélope Cruz and Nicolas Cage. An Italian commander falls in love with a Greek girl whose fiancée is fighting in the war as well. Enigma (UK/US/Germany/Netherlands 2001) Dougray Scott, Kate Winslett and Jeremy Northam starring in this WWII drama about a young heartbroken man trying to break the Enigma code. Pearl Harbor (US 2001) Real blockbuster cinema. WWII. Pearl Harbor. Two young bomber pilots are in love with the same young woman, a nurse. Slick, good-looking movie with equally good-looking actors (Kate Beckinsale, Josh Hartnett, Ben Affleck). House of Fools (Russia/France 2002) A war movie that is no war movie. Set in a mental institution during the Chechen war. Charlotte Gray (UK/Australia/Germany 2002) Cate Blanchett in a movie based on Sebastian Faulk’s novel. She plays a Scottish nurse who joins the French Resistance looking for her boyfriend, a RAF pilot who got lost in France. Yossi and Jagger (Israel 2002) Love between two Israeli soldiers stationed on the Lebanese border. Resistance (US/Netherlands 2003) Starring Bill Paxton and Julia Ormond. WWII, occupied Belgium. A reconnaissance plane crashes. The pilot, Ted, is brought to Claire and Henry Daussois who are in the Maquis Resistance. Ted and Claire fall in love. Cold Mountain (US 2003), Renée Zellweger, Jude Law and Nicole Kidman in a story of the American Civil War. Head in the Clouds (UK/Canada 2004) Starring Charlize Theron, Penélope Cruz, Stuart Townsend,Thomas Kretschmann. A romantic drama set in 1930’s England, Paris, and Spain. Three people share an apartment in Paris, one lives a hedonistic life, the others want to join the fight against fascism. Island at War (UK 2004, TV mini-series) WWII. The channel islands during German occupation. After the island is invaded by German forces, life changes drastically. The series focuses on three families. A Very Long Engagement (France/US 2004) Audrey Tautou in a movie about a woman whose husband doesn’t return from the battlefields of WWI and sets out to look for him. King Arthur (US/UK/Ireland 2004) An epic adventure of war and romance starring Clive Owen, Keira Knigthley, Mads Mikkelsen, Ray Winstone and Ioan Gruffud. The re-telling of the story of King Arthur and his Knights. The Christmas Card (US 2006, TV) A US soldier visits a town from where a Christmas card has been sent to him during his tour in Afghanistan. Closing the Ring (UK/Canada/US 2007) Christopher Plummer, Shirley MacLaine and Mischa Barton in a love story that plays then – during WWII – and now. A woman between two men. One is a pilot and gets lost after crash landing in Ireland during WWII. In today’s Ireland a young man finds the wedding ring and brings it to the woman living in the US. Set in Ireland and the US. Dear John (US 2010) Channing Tatum and Amanda Seyfried in a weepy romance about a young Marine who falls in love prior to 9/11. When he leaves for Iraq their love is tested. What about you, have you seen many of these movies? Did you like them? Have I forgotten one you would like to recommend?